An unnamed lone librarian (also old before her time and quite bitter) in France. A stranger in the library. The librarian works in the Geography Section in the basement and that is where this story begins. A hundred-page monologue on the life of a librarian, on the beauty of books, reading, the world, love, losses and her crush on a reader named Martin who visits the library very often. This in short is the exquisitely told story of “The Library of Unrequited Love” by Sophie Divry. It is sparse and yet so magnificent in its scope and treatment. What I loved about the book is that it does not exclude the non-readers. In fact, it just gives them the space to grow in a library and discover themselves. In fact the narrator might come across as angry sometimes, but she is also very warm and speaks of the years gone by, literature and the Dewey Decimal System with much fondness. Her ranting then doesn’t seem half-bad as you go along in the book. The protagonist is fierce and melancholy and tragic, all put together but what carries her on regardless is her love for books and the written word, which again reflects immensely in Divry’s writing. There are no traces of sentimentality at all, though it could get that road quite easily. Divry leaves a lot to the reader’s imagination as we turn the pages, which works very well when it comes to a book as short as this. The translation from French by Sian Reynolds encapsulates the rhythm of the original beautifully, while also talking of French History and Culture which is quite accessible. 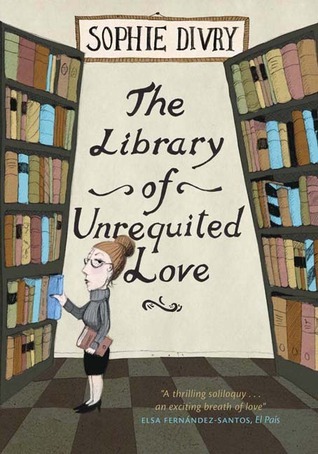 “The Library of Unrequited Love” is a book for everyone who loves books and reading. It is for everyone who has ever faced or gone through unrequited love. Get that cup of hot chocolate and get started with this one. Savour it. You will be done in less than two hours and yes, the taste will still linger. This entry was posted in Books, Literary Fiction, MacLehose Press, Novella, Reading, Review and tagged Librarians, Library, literary fiction, MacLehose Press, novella, reading, The Library of Unrequited Love on January 16, 2015 by thehungryreader.